Monday night we received barely a half-inch of sticky snow, after which the temperature dropped steadily throughout the day yesterday. 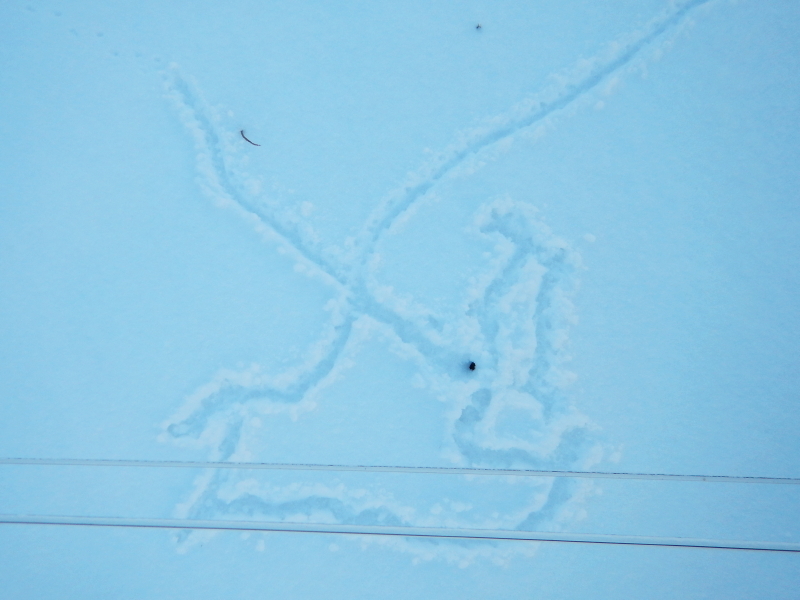 When I got home from work and took Delilah out for a walk before feeding the horses, there was a very clear display of fresh tracks in the snow that obviously had been created within the roughly 16 hours prior. The vast majority happened to be easily identifiable as rabbits. I was actually surprised by the significant volume of activity attributable to the little rascals. What do they eat in the winter? Whatever it is, we must have a lot of it and they must be thriving this year. 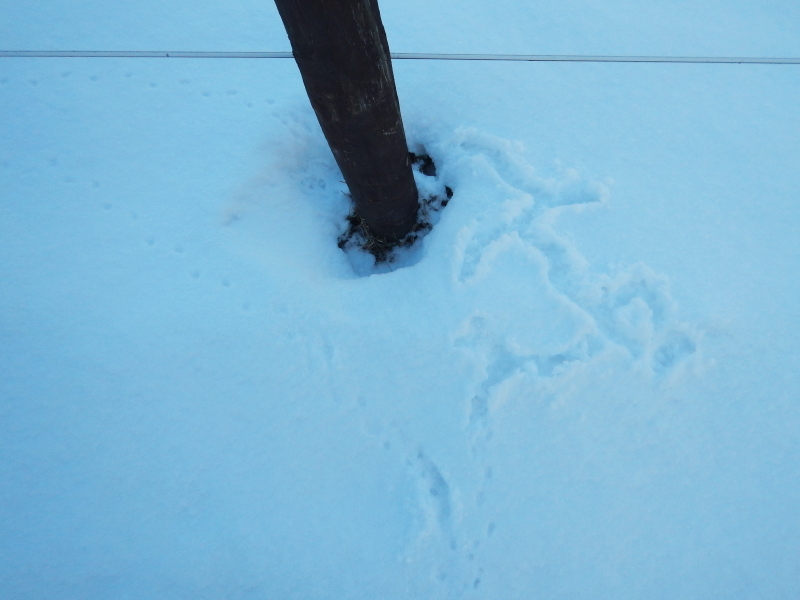 I was about to declare rabbits as the only animals moving around yesterday until we reached about three-quarters of our travel to the barn and came upon some tracks from much smaller feet. I’m thinking they were probably squirrels or chipmunks. Then we came upon some wonderful artistry from a little mouse or mole that was splitting time between treading lightly on top of the crust and burrowing some vivid designs through the snow. I wonder what he was trying to spell out. 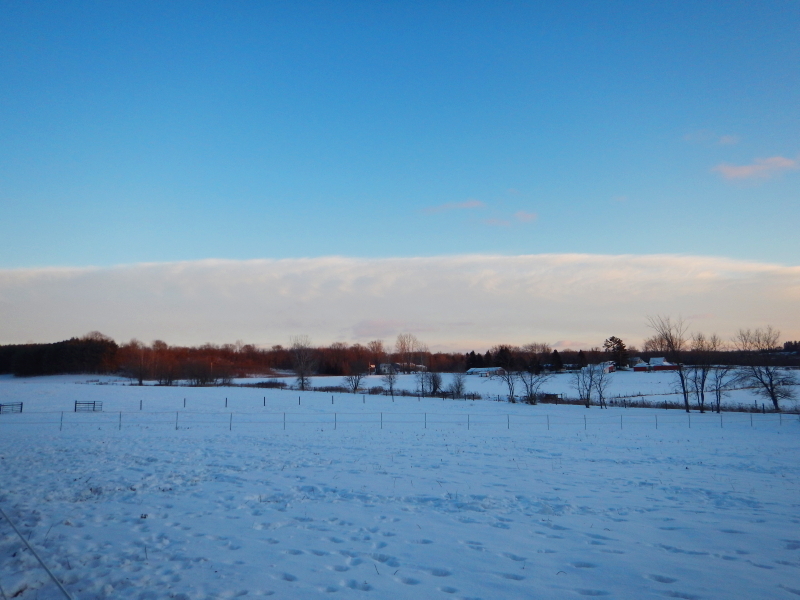 As we turned the corner around the back pasture on our route to the barn, I noticed how the sky revealed the departing weather system that had delivered the small amount of precipitation we received. Behind it are the clear skies that make way for our descent into very cold temperatures. The next few days will involve single-digit highs and below zero lows. It’s a little bit like what January is supposed to feel like around these parts. I may have to start wearing a coat again.